A range of speciality cookware for table cooking all constructed to the highest standards. 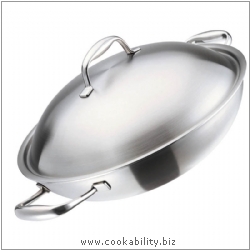 In the stylish multiply stainless steel wok, vegetables, meat or fish can be prepared at high temperature in a manner that is both healthy and gentle at the same time. A must in every kitchen, and not only for Asian dishes. High quality multilayer allows a fast and ideal heat transmission. Preparation at high temperature. For all hob types including induction.